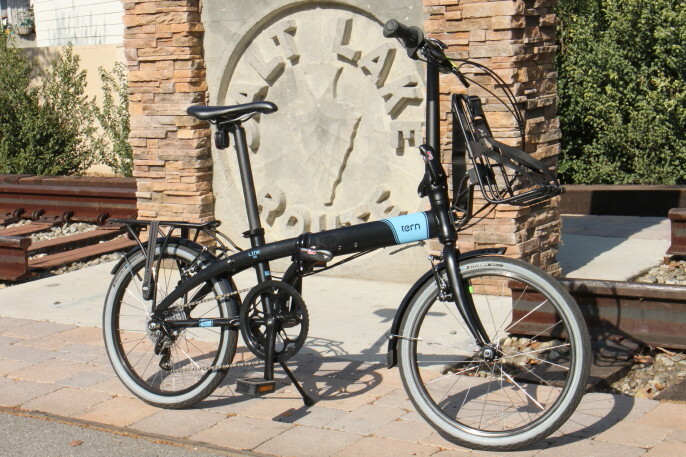 Tern Link D8—Folding Bike Perfection Anyone Can Afford. With sleek looks and a great ride, I love this bike. I was having a little difficulty starting this post, yet I know what I want to say. It came to me during a series of Facebook messages with a friend in England about a iTune app called 53. It made me remember how resistant to change I have been through the years, like many I’m sure. My first exposures to folding bikes in the past was less than stellar, but now I love them. As a part-time bike shop mechanic in the early 90‘s, I would work them (folding bikes) over when needed, yet we had none on the sales floor. I don’t think it was the looks that shunned my interests, it was the way they rode. With major frame and handlebar flex, poor folding and just a general cheapo feel, I had no desire to ride them more than a basic test hop after the service was complete. You can see the cool optional front rack from this angle. All that has changed in force. 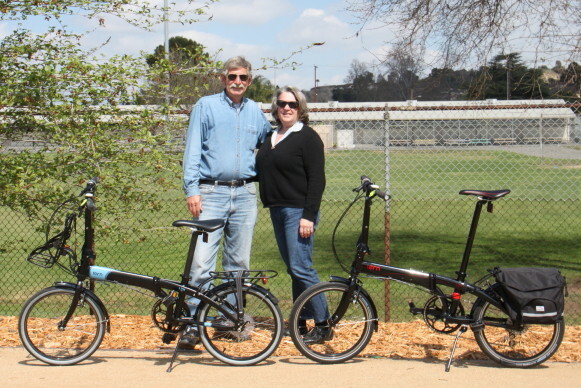 Modern folding bikes (the better ones) are rock-solid, fun-riding everyday bikes. Add in a reasonable price point and you have the Tern Link D8. Here is a bike you can enjoy and ride as your only bike in the stable. It’s light, stores and secures easily, has many gears and rides great. It fits a wide varieties of body sizes and styles. It looks sleek and has some nice pieces. It is just one great little bike. With a strong aluminum chassis, the fold and hinges are designed to add to the versatility. At the frame joints they achieve a firm connection with contoured plates that maximize contact when unfolded. The latches look and work well, lock down easily and match the flow of the frame. The fold of the bike happens quick and makes it small enough to carry easily and store almost anywhere. 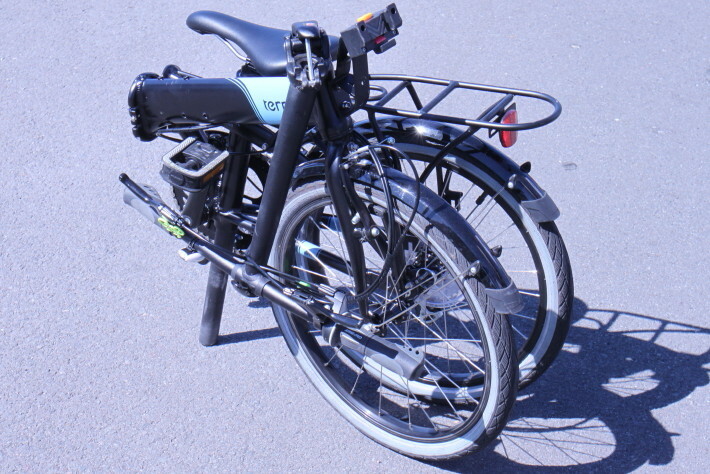 This Tern comes factory equipped with light-weight fenders and a full-sized rack. They add to the utility just like the folding aspect. The nicely designed BioLogic tail light / rear reflector snaps out of the way on the seat rails. The one I’m testing even has the optional front carrier block. Mine came with the front rack, but a bag or basket can be had that also snaps onto the carrier that bolts to the head tube of the bike. Very handy indeed. The one-piece handlebar stem fits riders of all statures and no real flex is noted there either. The bars have a quick release to allow them an adjustment in angle and to minimize the fold size if needed. On the bars you find a twist shifter to control the 8 gears and a pair of brake levers that fit your hands in a comfortable way. The ergo grips do the same. During the ride you find good handling that is secure yet agile. The Schwalbe tires match the bike and provide a good combination of smoothness and grip. With flat protection and reflective sidewalls, I was pleased with them on every ride I took. The beefy rims, spokes and hubs appear to be made to handle any abuse you want to dish up. 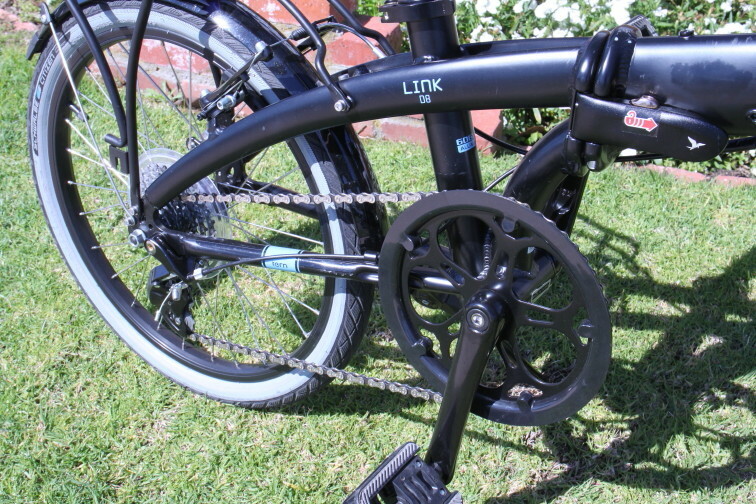 Plus the color matching to this matte black bike rounds out the sleek look the Tern Link D8 offers. With 8 gears to choose from, one will be right in any riding situation. Going through the gears is easy and you will find the range there more than sufficient. I took some fairly steep climbs in stride and was able to maintain a brisk pace on the flats. The Tern never missed a beat as I worked the gear set through its paces. The front sprocket has a outer chain guard the will keep your cuffs clean and out of harms way. The drive train is just one more part of this popular folder I could find no fault with. You might know that I have my own Tern (the Link P9) and that I recently spent a couple months with their top-end machine, the Verge X20. It is natural to want to compare them both with the D8. A quick glance would make you think they are the same bikes. But with just a little time many of the differences stand out strong. Of course the Verge X20 has a completely awesome drivetrain and the rolling pieces are exceptional. The weight of the Verge is almost non-existent. Fun is just one name of the Tern Link D8’s game. It is the Link P9 that shares the most with this D8. They are kissing cousins with just minor variances in the two. A slight weight gain is noticed in the Tern Link D8. It’s not much and the other things that they don’t share are the tires, hubs, the amount of gears and other very minor things. On my scale I found this—P9 25.5 lbs.—P9 with fenders and rear rack 27 lbs.—D8 with fenders and rear rack 28.5 lbs.—D8 with fenders, front and rear rack 30lbs. From this I concluded the basic D8 is only 1.5 lbs heavier than the P9. And that the fenders weigh .5 lbs, the rear rack is a pound and the front rack with the carrier block is 1.5 lbs. The slight difference of the Tern Link D8 is due to the minor items speced on the wheels and drivetrain. As you can see, no matter which one you choose, they are all pretty easy to pedal and carry around. BTW, the Tern Verge X20 pushes the scale at 20.5 lbs. From a price standpoint, the D8 is a great deal. It is set at a place where picking one up for yourself won’t set you back much. The P9 isn’t that much more, but the Verge is in a whole different ballpark. The D8 is so popular (major sales from what I’ve heard) because of the great features, fantastic ride, incredible convenience and the low price. That’s a group of selling points that can’t be denied. My wife and I are in the process of picking out a companion to our Link P9 and the D8 is in the major running there. This shot is just one from many rides we took together. That is one more factor I haven’t covered yet. Having the two matching folding bikes has been a dream. We have taken them on many local and semi-distant rides. For a while it was the P9 and the Verge, and lately it has been the P9 and the D8. Slipping them in the back of the wagon to enjoy touring rides out-of-town is the feature I like best. Others will like the security of being able to take them to their offices or apartments on upper floors. All will like them for the fun and smoothness of the ride. So if you have been hesitant to try a folding bike, everything has changed. They ride like regular full-sized bikes but offer so much more. Consider what one can do for you. The line of Tern bikes has one for every interest and pocketbook. I have moved into the future, something I find surprising, yet I couldn’t be happier about. How about you? Turbo Bob. 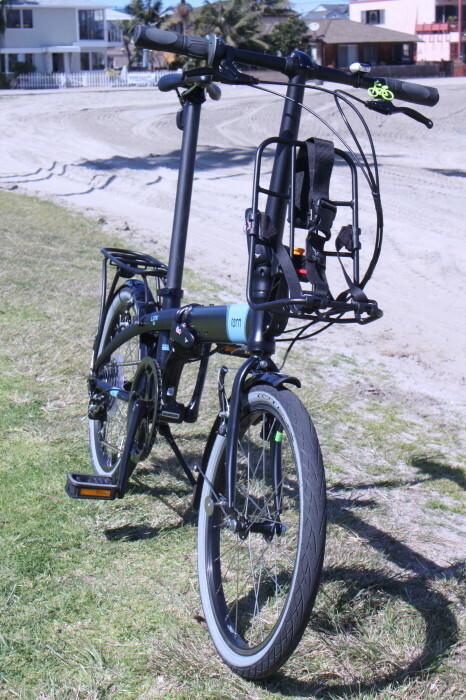 This entry was posted in Bike test reviews, Folding Bike test reviews. Bookmark the permalink. conveniently used on the metro rail trains (here in LA)? Patrick, very good question. I have taken my regular bikes, E-bikes and folding bikes (folded and un-folded) on the local Red Trolley here in San Diego many times. Plus we do a yearly trip to Santa Barbara with our bikes. In all these cases we can ride up to the outdoor platforms by the trains with ease. One simple answer could be a fold-up wheeled trolley cart to roll the folded bike to the platform. A few bungee cords could secure it to the cart. Most folding bike companies offer carry bags with shoulder straps. I’ve seen more than a few posts where a large Ikea bag has been used in such a manner. One benefit of the carry bag is to disguise it from being recognized as a bike (some rail systems charge extra for bikes, but not for large bags). Having the lightest folding bike possible will sure help with this part. Brompton has a wheeled rear rack that claims to allow the bike to be moved as a cart (even as a shopping cart with the front basket attached). It does seem that the close spacing of the wheels doesn’t make it as stable as can be. One nice thing about today’s folding bikes (most all of them) is that they do ride like full-sized bikes and can even fully replace a normal bike. 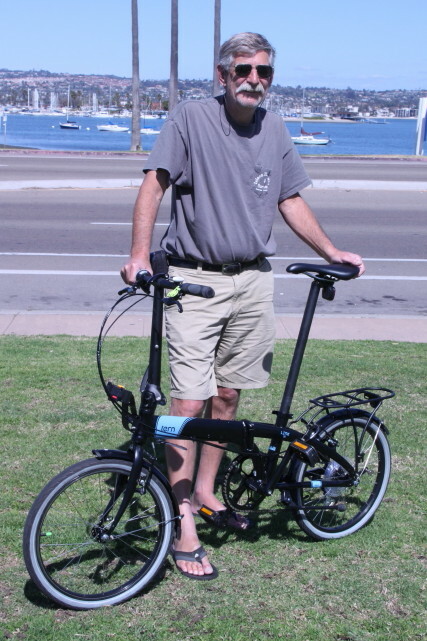 The Brompton folds the smallest, and is the easiest to carry (balance wise). Some of your answers I can’t answer. And the article you propose is a little out of my ideas and area. Anyone out there have any input on Patrick’s request? I had a Dahon for a while (and we have a couple of them at work) and found that with a little practice they can be wheeled around when folded up. Just leave the seat up and use it as a handle to control the bike as you wheel it about on the train station platform or inside the train (then lower the seat at the last second before stowing between seats, or whatever). From what I can see online, Dahons are very similar to Terns (at the various price points). be carefull on this model bike! The frame has broken on some bikes resulting in injury! Dave, as much as I dislike reading web forum pages I did read from the link you posted. What I can’t find is Tern’s final decision on the problem. It seems that two bikes (out of how many?–thousands?–tens of thousands?) did fail at the weld for the frame joint. Frames do break and fail on lots of bikes (no matter the material they are made of), so it’s hard to say what the story is here. The one thing I read is that the roads where these bikes were ridden are quite rough. I will continue to investigate this and find what has been done to find out why, fix the problem, and satisfy us consumers. All in all, I still think this is an awesome bike and fully trust Tern to do everything in their power to make it perfect. Thanks for the info and following my interests, Turbo. Yeah, it’s STILL on going, as there are four bikes now that have broken causing the riders injury. Reading the forum again (just for my own benifit as I own a Tern D8 also, so naturally I’m concerned), 2 riders that have had this aweful problem were from the UK, in fact ridden in London. That’s not rough terrain by a long shot! Also, yes welds do fail, but you dont expect it to occur on a brand new bike. I too will keep a watchful eye on this forum as by the looks of things there seems to be an issue here…. and Tern doesn’t seem to be telling the cutomers anything, especially the people involved in these horrific breakages!! First of all, great review. Secondly, I have to agree with Dave there! I’ve been following this tread on Terns forum for a while. More people are now reporting frame failures!!! Not just the Link D8 but other models….Scary stuff! I was thinking of purchasing a Link D8 or even the bigger frame bikes (hence why I was looking at your review) but now I think I’ll get a Brompton. Yes, a good deal more expensive, but I think it wont fall apart while riding on the road!!! Oh, and now Tern have made the ‘tern-link-d8-frame-shearing-two’ private…. which seems like they dont want people to stumble across it. You now have to be a registered member in order to read it. And by the looks of things the injured riders still havent heard back from Tern. Terry, I’ve heard the same, and talked to the head sales rep a few times about it. They are very serious about making things right—the people and the bikes. I have much confidence in Tern, in fact I just got my second. Another Tern Link P9 so my wife and I now have a matching pair. I am sure more about what has happened and what they are doing to solve any problems will be more evident soon. I am a Tern rider and proud of it. I do love Bromptons too. You do know I’ve been riding the H3L E-Brompton from NYCeWheels for over two years now. Great bike.